Not to be confused with Der Stürmer, a Nazi-aligned tabloid newspaper. Der Sturm (German: The Storm) was a German art and literary magazine covering Expressionism, Cubism, Dada and Surrealism, among other artistic movements. It was published between 1910 and 1932. The magazine was modelled on the Italian literary magazine La Voce which was published in Florence from 1908 to 1916. Among the literary contributors were Peter Altenberg, Max Brod, Paul Leppin, Richard Dehmel, Alfred Döblin, Anatole France, Knut Hamsun, Arno Holz, Karl Kraus, Selma Lagerlöf, Adolf Loos, Heinrich Mann, Paul Scheerbart, and René Schickele. Der Sturm consisted of pieces such as expressionistic dramas (i.e. from Hermann Essig [de] and August Stramm), artistic portfolios (Oskar Kokoschka and Curt Stoermer), essays from artists (the Kandinsky Album), and theoretical writings on art from Herwarth Walden. The most well-known publications resulting from the magazine were the Sturmbücher (storm-books), (e.g. Sturmbücher 1 and 2 were works of August Stramm – Sancta Susanna und Rudimentär). Postcards were also created featuring the expressionistic, cubist, and abstract art of Franz Marc, Wassily Kandinsky, Oskar Kokoschka, August Macke, Gabriele Münter, Georg Schrimpf, Maria Uhden, Rudolf Bauer and others. The term Sturm was branded by Walden to represent the way in which modern art was penetrating Germany at the time. 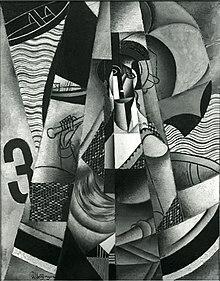 Jean Metzinger, 1913, En Canot (Im Boot), oil on canvas, 146 x 114 cm, exhibited at Moderni Umeni, S.V.U. Mánes, Prague, 1914, acquired in 1916 by Georg Muche at the Galerie Der Sturm, confiscated by the Nazis circa 1936, displayed at the Degenerate Art show in Munich, and missing ever since. Particularly in the time before outbreak of the World War I, Der Sturm played a crucial role in the French-German exchange of expressionist artists, which led to a special relationship between Berlin and Paris. Regularly, poems and other texts of French and/or French-speaking expressionists were published (Guillaume Apollinaire, Blaise Cendrars, etc.). This relationship was renewed after the war despite the hostilities between the two countries caused by the fighting. The magazine also fostered the Galerie Der Sturm, started by Walden to celebrate its 100th edition, in 1912. The gallery became the focus for Berlin's modern art scene for a decade. Starting with an exhibition of Fauves and Der Blaue Reiter, followed by the introduction in Germany of the Italian Futurists, Cubists and Orphists, the gallery was to exhibit Edvard Munch, Georges Braque, Pablo Picasso, Jean Metzinger, Albert Gleizes, Robert Delaunay, Gino Severini, Jean Arp, Paul Klee, Wassily Kandinsky, Serge Charchoune and Kurt Schwitters. After the war, Walden expanded Der Sturm into Sturmabende, lectures and discussions on modern art, and Die Sturmbühne, an expressionist theatre, as well as publishing books and portfolios by leading artists such as Oskar Kokoschka. Despite this, the gallery declined in importance after the war and closed in 1924, leaving the magazine to carry on as a quarterly until it too closed in 1932. However, concerning the exact closing date of the Der Sturm Art Gallery (an offshoot of the magazine) as Maurice Godé, wrote in his book "Der Sturm of Herwarth Walden or the utopia of an autonomous art", the author wanted to promote the German "avant-garde" arts by means of both resident and touring exhibitions. Accordingly, Walden organized, until 1932, more than 200 exhibitions in its premises in Berlin plus multiple other touring exhibitions (Wanderausstellungen) in Germany and also in most other major European cities. ^ Douglas Brent McBride (2006). "Expressionism, Futurism, and the Dream of Mass Democracy". Studies in 20th & 21st Century Literature. 30 (2). Retrieved 2 November 2014.